Hey beauties and Nail Polish Lovers! There is an exciting contest going on with Rite Aid. I know many of you are big nail enthusiasts. So, check it out! Rite Aid just informed me of their Search for the Rite Aid "Nail Enthusiast". 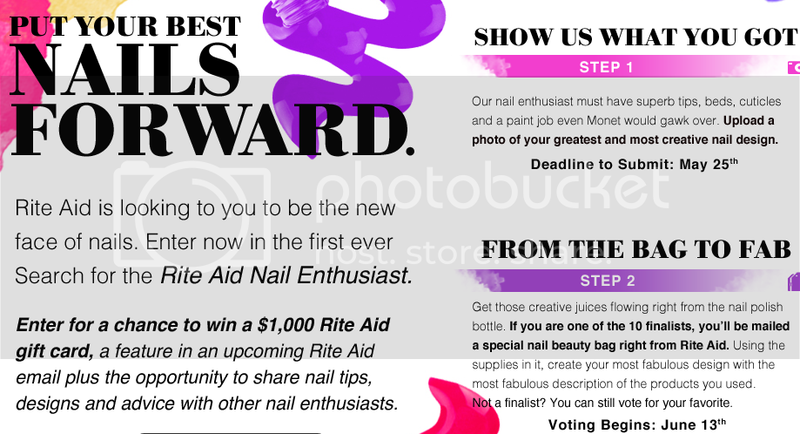 The winner will receive a $1,000 Rite Aid gift card, a feature in an upcoming Rite Aid email, plus the opportunity to be the new face of nails sharing nail tips, designs and advice with other nail enthusiasts. Top prize = $1,000 Rite Aid gift card and status as the new "face of nails"
Send your most creative nail designs to http://riteaidnails.com from May 10 – May 25. Be sure to include an original picture of the nail design, along with a design name and description. Rite Aid will have a panel of influential nail judges choose 10 finalists who will move to the next round. Julie G. (Jesse’s Girl nail expert). What are the judges hoping to see??? 10 finalists will receive a nail care kit filled with goodies from Coty, L’Oreal, Revlon, Jesse’s Girl and Essie, etc. The finalists will have to use the kit to create a brand new nail design. The public will vote on their favorite design during the grand prize voting period, and the finalist with the highest number of votes will be deemed the winner! Check out Rite Aid's Facebook page, Twitter, and Pinterest. Happy Mother's day new momma :) I hope you had a great one!! Thanks for such a great blog!